We present a novel approach for assessing pesticide toxicity on mammalian cells, by measuring the response patterns of four cell lines (two neuroblastoma and two fibroblast) to three different pesticide groups (carbamates, organophosphates, pyrethroids) at a broad range of concentrations. Two different aspects of the cellular bioelectric response are measured, namely the potential and the combined resistance + capacitance of the cell suspension. Both the cell line and the mode of measurement affected the observed in vitro cellular responses, with each cell type providing a unique pattern. The measured of resistance + capacitance through amperometry provided more reproducible results than potentiometry. The results of the study demonstrate the potential of bioelectric profiling as a tool for developing novel toxicity assays and associated biosensors with superior analytical capacity, speed of assay and the ability to respond to a broad spectrum of toxicants, at the same time satisfying the demand for increased cost-efficiency and ease of operation. Mammalian cells are a unique tool for in vitro toxicity assays, since they represent, with a fairly high degree of accuracy, the actual biological targets of many environmental pollutants or other compounds with proven or suspected toxicity. In a broader sense, higher eukaryotic cells have been recruited as biorecognition elements either in advanced cell-based biosensors (CBBs) or in cell-based assays (CBAs) . Whichever the case, the final output of any cell-based test system is the measurement of the deviation of a predetermined cellular function from control, “baseline” levels as a result of exposure to a toxic compound. This information can be used either for assessing the biotoxic properties of the assayed sample or, in the case of CBBs, for determining the analyte in question, mainly qualitatively and, preferably, quantitatively as well. A sufficiently high speed of measurement, low cost and ease-of-use, to satisfy high throughput requirements: most currently available methods for measuring toxic effects on mammalian and other cell types are associated with either optical (dye-based)  or electric (impedance spectrometry)  working principles implemented in multi-step processes, which demand several hours before enough data are collected. The availability of skilled personal for the operation of such systems is an additional drawback. Ability to respond to a broad spectrum of toxicants and providing, at the same time, a more or less unique pattern of response against individual compounds (or at least groups), so that selective detection is feasible. So far, this has been achieved only against a very limited number of organic toxicants and pathogens, thanks to the advent of technologies such as CANARY  and the Molecular Recognition through Membrane Engineering . Still, the vast number of pollutants of interest has prohibited the rapid development of cell lines with selective biorecognition elements. Finally, the ability to provide quantitative or semi-quantitative data rather than just qualitative information from screening an unknown sample. Bioelectric assay methods based on mammalian cells have gained considerably in popularity over the past few years. Model approaches are represented by the measurement of (1) extracellular recordings from cardiac myocytes cultured on microelectrode arrays (MEA) , (2) the impedance of adherent cells in culture [7,8] and (3) membrane potential of cells immobilized in a gel matrix (the Bioelectric Recognition Assay – BERA) [9,10]. In the present report we describe a new approach for the simple, rapid and cost-efficient measurement of bioelectric patterns of different mammalian cell lines in response to toxicants belonging to different chemical groups. Our approach is based on a modification of the Bioelectric Recognition Assay, with the following novelties: (a) cells used as biorecognition elements are suspended, not gel immobilized, thus drastically reducing the cost of each assay (b) two different aspects of the cellular bioelectric response are measured, namely the potential and the combined resistance + capacitance of the cell suspension. In this way, the amount of information derived from each assay is considerably increased. We demonstrate that the proposed approach can be applied to the high throughput, differential characterization of the toxic effect of selected pesticide groups on mammalian cells. The three categories of pesticides that we used are carbamates, organophosphates and pyrethroids. The mechanism of action of carbamates and organophosphates is the inactivation of the enzyme acetylcholinesterase . On the other hand, pyrethroids can affect the permeabilities to sodium and potassium ions . Both the pesticide groups and the individual compounds which were used in the present study were selected on the basis of the occurrence of the residues of the respective pesticides as well as their commercial availability. For this purpose, an excessive survey was conducted in four basic axes, i.e. market research, literature, official authorities and official reports. Based on the results of the survey, a specific formulation was created for each pesticide group, as presented in Table 1. In this way, each group contained pesticidal compounds which are representative (i) of different levels of solubility in water or polar solvents, since nonpolar solvents are not suitable for use with cellular biorecognition elements and (ii) of actual compounds currently used in European agriculture. The use of pesticide mixtures, each corresponding to an individual group, allows for safeguarding a group-specific cell response irrespective of minor differences in the mode of action among pesticides belonging to the same group. In addition, in real-life agricultural applications commonly mixtures of 2-5 pesticides are sprayed instead of single compounds. Therefore, the use of mixtures was deemed more appropriate for our experimental approach. Due to the fact that individual pesticides are associated with different Minimum Residue Level (MRL) values, we decided to create the three different mixtures (corresponding to the three different pesticide groups) by adding pesticides at concentrations ranging from the lowest to the highest MRL values commonly associated with residue analysis (0,0025-0,05 ppm). In this way, the present cell-based assay was developed on the principle of cell exposure to increasing cumulative pesticide accumulation within each group from a minimum to levels exceeding the MRL, in reflection of the actual field conditions regarding residue distribution in real samples. Commercial formulations were used for preparing standard pesticide solutions daily in double distilled water. All other reagents were purchased from Fluka (Switzerland). Cells were cultured in Dulbecco’s medium with 10% fetal bovine serum (FBS), 1U μg-1 antibiotics (penicillin/streptomycin) and 2mM L-glutamine. Cells were detached from the culture and concentrated by centrifugation (2 min, 1200 rpm, 25°C), at a density of 2.5 x 106 mL-1. During each assay (see below, 2.3) cells were used at a density of 1000 μL-1. The following cell cultures were used in the present study: (a) Two immortalized mammalian fibroblast cell lines: African green monkey kidney (Vero) and Hamster adult kidney (HaK), (b) Two neuroblastoma cell lines: Mouse neuroblastoma (N2a) and Human neuroblastoma (SK-N-SH).Cell cultures were originally provided from LGC Promochem (UK). In this way, a relatively wide representation of mammalian cell targets was used for assessing the effect of exposure to pesticides. The two neuroblastoma cell lines (N2a, SK-N-SH), being neuronal, are natural targets of all three pesticide groups, due to the inhibition of either acetylcholine esterase (AChE) (organophosphates, carbamates) or ion channels (pyrethroids). Under control conditions (no pesticides present), when acetylcholine is added to the cells, it causes a temporary depolarization of the cell membrane (excitation), which is rapidly cancelled out by the specific cellular mechanisms. However, when pesticides are present, they inhibit these mechanisms (such as AChE), thus allowing for a continuous stimulation of the neural cells. The ensuing membrane depolarization can be measured by appropriate methods [10,13]. On the other hand, non-neuronal fibroblast cell lines (Vero, HaK) are also able to respond to pesticides with a considerable change of the cell membrane potential, as previously shown for Vero cells treated with either organophosphates or carbamates , an effect that has been partially attributed to pesticide interactions with the zinc receptors on the kidney cells . Both potentiometric and amperometric measurements were received by means of a customized, 8x channel potentiostat (Uniscan, Buxton, UK). The system allowed for measuringelectric signals from cells suspended on the screen-printed working electrode and allowing for high throughput screening and high speed of assay (duration: 3 min). The system is presented as a lab based bench top based on a modular potentiostat design. A connection interface including a replaceable guide allowed inserting electrode strips directly into the instrument, utilizing one electrode strip per channel. The sensor strips plug directly into the front panel of the instrument channels via a bespoke sensor connector (Fig. 1). Each electrode strip comprised a 0.5mm thick ceramic substrate with three screen printed electrodes (working electrode – WE, reference electrode – RE and counter electrode – CE). In order to facilitate high throughput screening, DRP-8X110 disposable sensor strips (WE: carbon, RE: Ag/AgCl) bearing eight electrode pairs (corresponding to eight measurement channels) were purchased from DropSens (Asturias, Spain). Potentiometry: According to the working principle of the Bioelectric Recognition Assay, at the moment of sample application to the top of the cell suspension (the biorecognition element), the toxic compounds under detection will interact with the part of the sensory cellular material in the area of the measuring electrode, causing a change of its electric properties. At the same time, however, the part of the biorecognition element in the area of the reference electrode will retain the initial value of these properties (rest potential). In this way, an electric potential will be created between the two electrodes. Amperometry: The planar electrode-cell system can be considered as a series of n cell layers acting both as bipolars and as capacitors whereas the current flow in relation to the total impedance between the measuring electrode and the reference electrode. Each cell has a conductance Gi,j and a capacitance Ci,j (where i=1…n and j=1…m) depending on its position within the probe . Thus the sensor resembles an RC circuit consisting of a group of n capacitors serially connected to each other: upon sample application, the initially reacting part of the sensor (the first cell layers or ‘capacitors’) is electrically charged until a certain maximum value is achieved. The equivalent capacitative time constant of the sensor is characteristic and specific for each toxic agent. Thus, a given analyte (e.g. a pesticide residue) demonstrates a unique pattern of biosensor response over a definite range of concentrations, like a ‘signature’. Experiments were set-up in a completely randomized design. Each sample (different pesticide mixture) was assayed eight times and each experiment was replicated three times at different time periods. Results were assessed by a standard analysis of variance for a randomized complete block design. Both the cell line and the mode of measurement (potentiometry vs. amperometry) influenced the observed pattern of cellular response in vitro to increasing concentrations of the three different pesticide groups. In other words, specific responses were observed for individual [pesticide group X cell line X bioelectric method] combinations as detailed in following. According to the potentiometric assay, HaK cells were mostly affected by carbamate pesticides, showing considerable increase in bioelectric potential with increasing pesticide concentrations (Fig. 2A). At the other end of the range of responses, SK-N-SH neuroblastoma cells showed a very slight increase. The other two lines, Vero and N2a, demonstrated a different pattern, characterized by decline of the bioelectric potential with increasing carbamate concentrations. An entirely different pattern was observed regarding the response against the mixture of organophosphate pesticides (Fig. 2B). In essence, all cell lines responded in a more or less identical manner, whereas N2a cells maintained a practically constant bioelectric potential with increasing concentrations, while the other three lines showed a minor response, albeit in opposite directions (decline for SK-N-SH and increase of the potential for Vero and HaK). Exposure to the third pesticide mixture of pyrethroids resulted in another distinct bioelectric pattern of responses (Fig. 2C). An apparent concentration-dependent decline of the potential was observed for N2a cells, much less so for Vero and HaK cells. On the other hand, essentially no change was recorded on SK-N-SH cells. After the statistical analysis, correlation was found between the MTT (analytical results not shown) and potentiometry/amperometry. Specifically, the correlation between the MTT and potentiometry/amperometry for carbamates was observed in HaK (r2=0.99/0.87), for organophosphates in Vero (r2=0.67/0.97) and for pyrethroids in N2a (r2=0.71/075). HaK cells demonstrated a very considerable increase of bioelectric conductivity with increasing carbamate concentrations, followed in a similar pattern by SK-N-SH cells (Fig. 3A). On the contrary, the conductivity of N2a cells decreased considerably with the pesticide concentration. Vero cells also responded in a declining mode, albeit much smaller in intensity, i.e. in a statistically non-significant pattern. When exposed to the organophosphate pesticide mixture, SK-N-SH neuroblastoma cells demonstrated a considerable increase of bioelectric conductivity (Fig. 3B). A much more moderate, though significant, decrease was observed for Vero and HaK cells. No change of conductivity was recorded on N2a cells. Finally, the pyrethroid mixture caused a concentration-dependent increase of bioelectric conductivity in SK-N-SH cells (Fig. 3C), but a considerable decrease in N2a and Vero cells. In this case, no substantial change of conductivity was recorded on HaK cells. 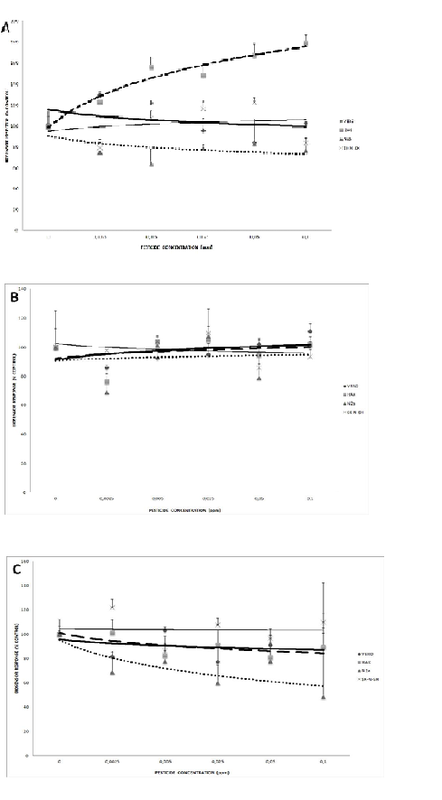 Considering the statistically significant results of bioelectric amperometric measurements, it was possible to identify which cell lines stood out by their dose-dependent response against different pesticide groups (Table 2). The bioelectric response of either the immortalized HaK cells or neuroblastoma cells could be used in order to assay the effect of carbamates. On the other hand, HaK, Vero and SK-N-SH cells produced a practically useful response against organophosphates. Finally, a satisfactory pattern against pyrethroid pesticides of response was given by neuroblastoma cells and Vero cells. Mammalian cell lines, in particular the ones used in the present study, are being increasingly employed in pesticide toxicity assays [18-20]. Optical methods (including the assessment of cellular morphology and differentiation) and, more recently, genome analytic techniques  are the most popular among researchers, in spite of their relatively cumbersome use and long assay times. Therefore, there is a clear potential for the application of novel, faster analytical tools which could also satisfy demands for high capacity screening, as is the case for food safety laboratories, public authorities and large food companies. The results of the present study demonstrate that patterns of bioelectric response of mammalian cells lines can reflect the differential effect in vitro of pesticide molecules belonging to distinct chemical groups in a reproducible fashion. Depending on the combination of cell line x mode of bioelectric assay, dose-response relationships could be determined. It is worth noting that different response patterns were recorded from cell lines belonging to the same group, e.g. the neuroblastoma lines N2a and SK-N-SH. This is a clear indication of the unique physiological background of each cell line contributing to the final response to each pesticide group, even though the elucidation of the exact nature of the cellular mechanisms behind the observed differences was beyond the scope of the present study. In the case of the neuroblastoma lines, a possible explanation may lie on their origin from different species (N2a: rat, SK-N-SH: human) as well as the frequently heterogenous composition of SK-N-SH cultures of distinct cell types . We also included renal fibroblast cell lines (Vero, HaK) in our experiments since these are commonly used in toxicity assays and also for comparing effects with the neurologically disruptive effects on the neural cell lines (N2a, SK-N-SH). In non-neurological cells changes in the cell membrane potential may or may not be anticipated, depending on the pesticide group mode of action. For example, satisfactory correlation between toxic effects on the D-glucose transport system or the Na+/K(+)-ATPase and the lipophilicity of different xenobiotics such as pesticides was observed on functional properties of the plasma membrane of human skin fibroblasts . In its current configuration, our experimental set up could not assay endocrine disruptive effects unless these resulted into instant cell damage. Therefore, only compounds with toxic challenging properties could be tested, as also revealed by the correlation between our bioelectric profiling approach and the MTT test. Electrochemical methods have been previously used in conjunction with microbial cells in various toxicity assays. For example, P. putida has been used for the detection of aromatic hydrocarbons and organophosphate nerve agents , while S. cerevisiae Y190 has been used for determining endocrine disruptor compounds . 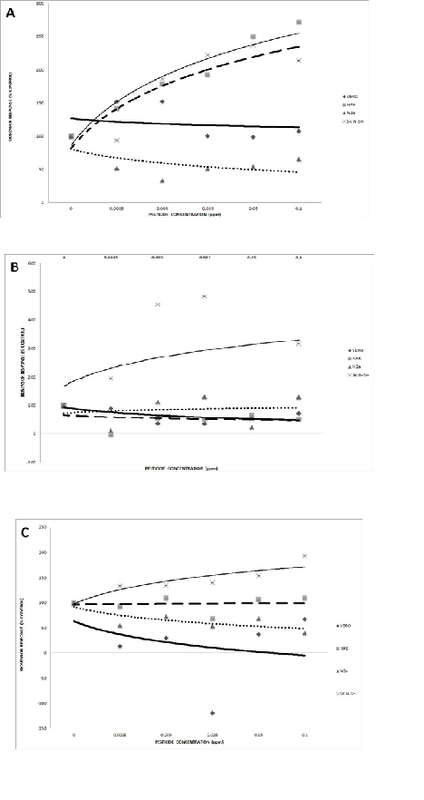 In the same context, amperometric measurements have been used with E.coli, Salmonella typhimurium and Ralstonia eutropha in genotoxicity assays [26-28]. Clearly, using mammalian cells has considerable advantages over precaryotic ones, especially allowing for a more realistic reflection of the investigated toxic effects on biologic species of interest, including humans. At the same time, the mammalian cell membrane machinery can be exploited to create a reproducibly distinct signal as a result of each unique cell line x toxicant interaction. Depending on the type of cell type employed, such signals may result directly from changes in the electric activity of the cell (as shown for neuroblastoma cells) or be associated with changes in ion traffic (e.g. calcium ions in the case of Vero cells . Many methods have been developed for measuring the mammalian cell membrane potential, though very few of them satisfy analytical requirements at a large, high throughput scale. For example, the detailed study of ion channel function with patch-clamp techniques suffers from low throughput and reproducibility, high cost and complexity , while fluorescence-based methods usually require multiple process steps while being limited by background signal . Both potentiometric and amperometric methods have been used in the past for determining pesticide toxicity on mammalian cells. Flampouri et al. developed a potentiometric BERA biosensor system based on immobilized N2a and Vero cells for the sensitive (limit of detection = 3 nM), qualitative and, in some concentrations, quantitative detection of the organophosphate insecticide diazinon and the dithiocarbamate fungicide propineb in tomato samples. Using a similar approach, Mavrikou et al. were able to detect the organophoshate pesticide chlorpyriphos and the carbamate carbaryl in tobacco in a concentration-dependent pattern, down to a concentration of one part per billion (1 ppb). Lokka et al. successfully applied the same potentiometric working principle to two different cell types (neuroblastoma and tobacco protoplasts) for detecting a mixture of two organophosphate pesticides, diazinon and chlorpyrifos in two different substrates (tomato, orange). Flampouri and Kintzios  reported the development of a chronoamperometric neuroblastoma-based biosensor utilizing PEDOT electrodes coated with Nafion and polylysine in order to measure cellular attachment and viability after exposure to toxic agents. However, existing rapid bioelectric toxicity assays often demand the use of cells in culture (e.g. through the provision of a microfluidic culture system) or in immobilized state (in a gel matrix or attached on an electrode surface) [10,14]. In this respect, by using cells in suspension, our approach considerably facilitates the assay procedure, at the same time reducing the cost of preparing the cellular biorecognition element. It should be emphasized, however, that rapid changes in the cell membrane potential, as assessed by our experimental set up, are only indicative of the challenge of the cells by toxic compounds and do not per se provide information on the actual toxicity of the assayed compounds. Our experimental approach is a preliminary investigation of the possible use of the measurement of bioelectric responses as a means to detect this challenge rather than fully assess the scope of end point toxic effects. Another option for cell bioelectric profiling is represented by impedance biosensing. For example, Curtis et al. applied an impedance spectroscopy approach in order to characterize the effect of ten mammalian cell lines (including Vero) against the carbamate pesticide aldicarb and the general disinfectant sodium pentachlorophenate. However, the practicability of impedance toxicity assays, which are based on cell motility and/or number (both decreased as a result of treatment with the toxic analyte), can be seriously limited by their relatively slow response (one to several hours), which is due to the time required for the completion of the interaction between the toxicant the cellular system in order to deliver measurable signals. Therefore, the experimental approach described in the present report can be potentially exploited for the development of novel toxicity assays and related biosensor systems. In this context, bioelectric profiling offers a number of unique advantages, such as high throughput analytical capacity, due to the high speed of each assay and the feasibility of multichannel measurements. At the same time, it is possible to increase the amount of information received by assaying a single sample against a large number of different cell lines. The interpretation of the recorded bioelectric profiles can be further facilitated by novel user-friendly approaches, including the employment of artificial neural networks . Naturally, long term toxic effects cannot be determined within the three minutes of the duration of the bioelectric profiling assay. That said, differential bioelectric profiling using a series of different cell lines offers the ability to rapidly screen for compounds with cell-damaging properties in at least some of the employed cell lines (for example, AchE inhibition in neuroblastoma cells), even though the exact effects should still be investigated with other, conventional methods. Georgia Moschopoulou was responsible for the conception and design of the experiments and contributed to the critical revision of the manuscript. Athanassia-Maria Dourou and Aggeliki Feidaki contributed equally to the actual experimental work and data acquisition. Spyridon E. Kintzios wrote the manuscript. Fig. 1. The prototype potentiostat with the custom-designed sensor strip-connection interface (A), allowing for measuring up to eight channels synchronously or independently. Table 1: Composition of target pesticide mixtures used in the cell bioelectric profiling experiments. Table 2: Summary of cell lines with optimal dose-dependent response relative to control against different pesticide groups using bioelectric amperometric assays. Moschopoulou, G., Valero, T., Kintzios, S. 2012. Superoxide determination using membrane-engineered cells: An example of a novel concept for the construction of cell sensors with customized target recognition properties. Sens Actuat 175, 88-94. T. Narahashi 1971. Mode of action of pyrethroids. Bull World Health Organ. 44(1-2-3), 337?345. Voumvouraki, E., Kintzios, S. 2011. Differential Screening of the Neurotoxicity of Insecticides by Means of a Novel Electrophysiological Biosensor. Procedia Eng 25, 964-967. 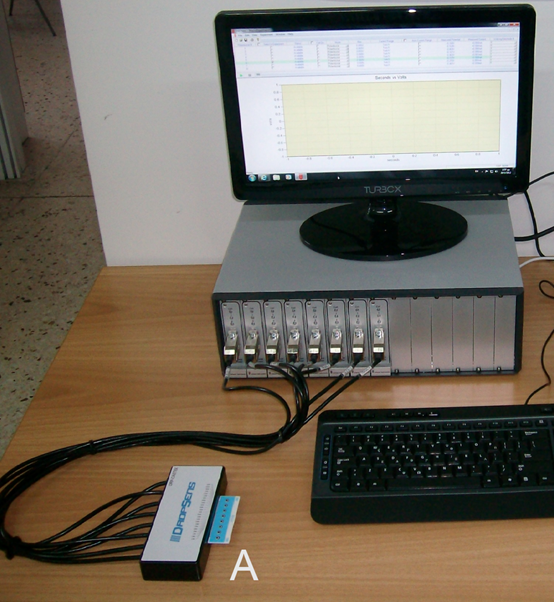 Lokka, K., Skandamis, P., Kintzios, S., 2013.Screening of total organophosphate pesticides in agricultural products with a cellular biosensor. Cell Bio 3, 131-137. Flampouri, E., Kintzios, S. 2011. Nafion and Polylysine Treated PEDOT Mammalian Cell Biosensor. Procedia Eng 25, 976-979.